GTRD uses 5072 ChIP-seq experiments for 476 human and 257 mouse TFs that correspond to 542 TFClass classes. Most of ChIP-seq experiments (61%) have corresponding control experiment. In average each TF has been measured in 9.37 ChIP-seq experiments, 54% of TFs have been measured in more than one experiment. This page or section is a stub. Please add screenshots here! 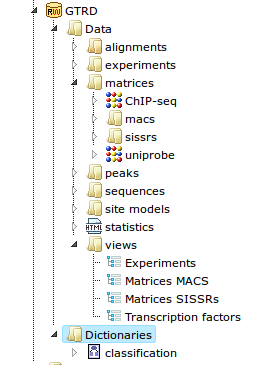 Start page contains search box and the links to browse all experiments in the repository tree, explore databases statistics and transcription factor classification tree. 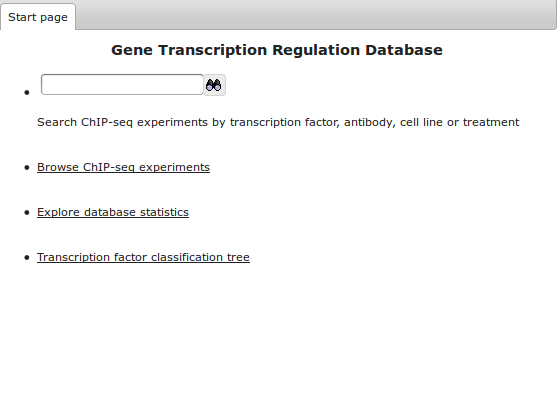 The ChIP-seq experiments contained in GTRD can be queried from the search box on the Start page. GTRD uses Lucene engine for indexing and quering ChIP-seq experiments that provides rich syntax for searching. The search can be performed by transcription factor(name or class), cell line, antibody or treatment/conditions. GTRD/Dictionaries/classification is TFClass classification tree used by GTRD to reference transcription factors.